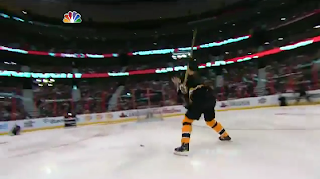 One of the most exciting moments of each and every NHL Skills Compeititon is see Bruins defenseman Zdeno Chara rip out his slap shot, trying to go for another record of his own. He sure did that tonight in Ottawa as he won his fifth consecutive Hardest Shot competition, with his hardest slapper of the five coming in at a record 108.8 miles-per-hour. I kid you not, that is one fast shot. Let's go to the videotape.